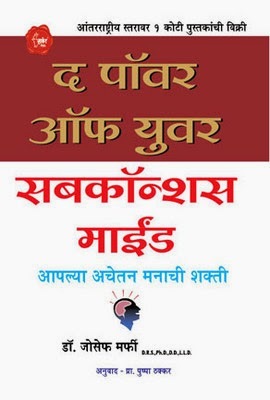 This book is a guide to extracting the power of the subconscious mind that can become the pathway to a successful life. In The Power Of Your Subconscious Mind, the eminent New Thought writer Dr. Joseph Murphy uncovers the hidden treasures of the human mind and guides his readers to achieve a nobler and more successful life. The book was originally published in 1963. 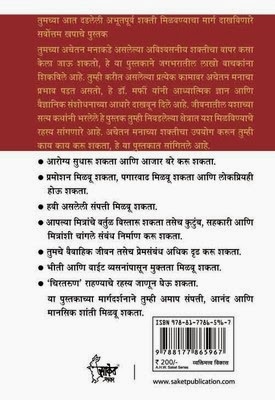 In this 2010 Marathi translation, it reaches out to a wider readership with its enduring and universally applicable principles. Murphy claims that an infinite pool of power and wisdom rests within the human subconscious. One doesn’t need any physical tools or additional equipment to achieve success in life. One only needs to extract from the subconscious and one would be able to realize all their desires. In this book, Murphy acquaints readers with the required working basis or universal principles of utilizing this hidden power. The principles are introduced through a discourse on the duality of mind, citing psychological studies, and real-life instances. The discussion extends to explain connections between the mind and body, and how mind helps in the healing of the body. It presents a detailed analysis of mental healing right from the ancient to the modern times. Issues related to wealth, happiness, success, and marriage are all resolved through the power of subconscious mind. With this, the readers are led on a path of spiritual awakening and the realization of their deepest yearnings. Joseph Murphy was a New Thought minister, working for Divine Science and Religious Science. He wrote numerous books on New Thought ideologies of mind, healing, prayer, and spirituality. They include The Miracles of Your Mind, How to Use Your Healing Power, and Infinite Power for Richer Living. Murphy writes about the practical application of spiritual concepts. He deals with common human concerns of success, relationships, and happiness. His work carries a blend of spiritual wisdom and scientific principles. Being a former chemist, he frequently uses analogies from chemical science to demonstrate his points. Murphy was born in Ireland on May 20 in 1898. He studied for priesthood and became a part of the Jesuits. He later left for America to attend the Church of the Healing Christ, part of Divine Science. He went on to become the minister of the Los Angeles Divine Science Church in 1949. He received a PhD in psychology from the University of Southern California. He died on December 16, 1981.